Some people get the post-Thanksgiving blues once the big meal is done. Me? Not so much. Since I do all the cooking (which I always call my own personal sporting event), my husband does the cleaning, and then it’s time for CHRISTMAS DECORATIONS. We have a rule in this house: no Christmas stuff gets put up before Thanksgiving. But the second those leftovers are in the fridge, I grab myself a glass of mulled cider and get to work on our tree. 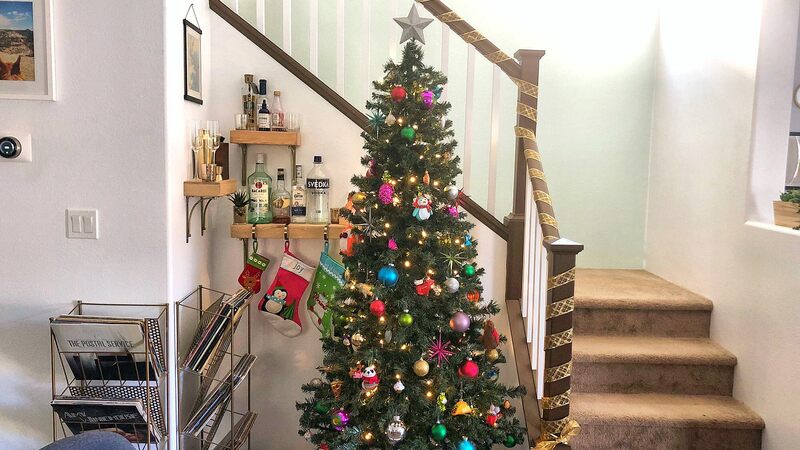 Maybe it’s a little bit of wanting to get my money’s worth out of my decorations, but mostly I just love the way a house looks with some extra glitter, tinsel & twinkle lights. The halls are decked from Thanksgiving night until New Years Day. Now, you might think I am sad that my biggest cooking day of the year is over… again, not so much. I don’t go quite as “hard” as Thanksgiving, but Christmas is another reason to make a holiday feast, so I decided to share some recipes that can carry over. I did a poll on Instagram asking my followers if they wanted my turkey recipe or my Hawaiian sweet roll stuffing recipe and the results were literally 50/50. So, ask and you shall receive! Today I’m going to start with the turkey. Not everyone wants to deal with the whole turkey all over again, so I’m actually going to give you my recipe for a bone-in turkey breast. This is perfect for about 4-6 people, and actually what I made on Thanksgiving since we had a small crowd. And maybe you don’t want turkey again at all, which is understandable. I know a lot of people who go with ham on Christmas, but I’m a poultry and seafood only kind of gal. 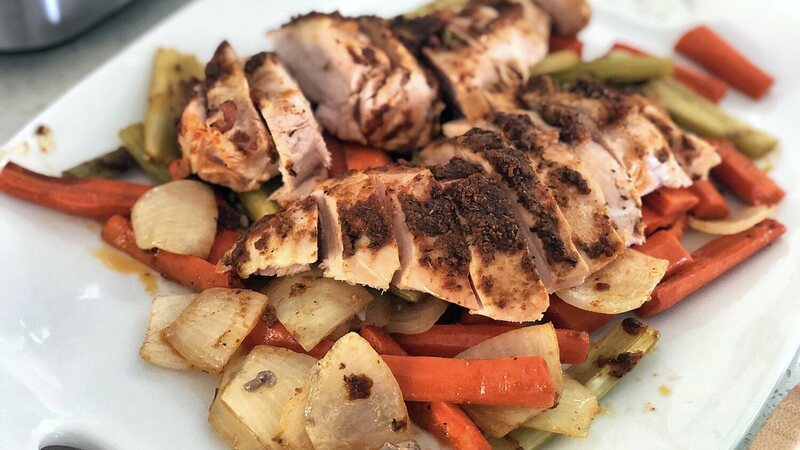 If you want to change it up just a little, you could also use this same preparation on a chicken! There are two parts to this recipe… the brine and the rub. First things first: you’ll need a bone-in whole turkey breast, approximately 4-7 lbs. (Mine was about 5 lbs this year.) Alternatively you could use a whole chicken. Put the beer, water, salt & brown sugar into a large stock pot and bring to a boil, stirring to dissolve the salt & sugar. One it starts to boil, add the remaining ingredients and lower the heat. Simmer it for 5-10 minutes, until fragrant. Place your turkey breast (or chicken) into a brining bag & carefully pour in the cooled liquid, including the lemon, garlic, herbs and peppers. Add more water if needed to submerge the breast fully. Tie the bag tightly, put in a pot or baking dish & refrigerate for 6 hours to overnight. If you have not heard of a brining bag, they are just thick, clear plastic bags you can get at the store. You can also use a sturdy trash bag or a plastic/glass container, if you have a big enough one. You don’t want it to be huge, because you don’t want to be adding a gallon of water to get the turkey submerged. If you are hosting a large crowd and want to do a whole turkey or two chickens, keep the brining recipe the same but double the rub. The only difference is you definitely want put it in the fridge overnight to brine. Before it’s time to cook, take the turkey out of the fridge, remove it from the brine, and pat it dry. Let it sit out and come up to room temperature. This is SO important. If the turkey goes in the oven cold, it takes longer to cook, and this way the skin starts to crisp up immediately, instead of having to warm up first. 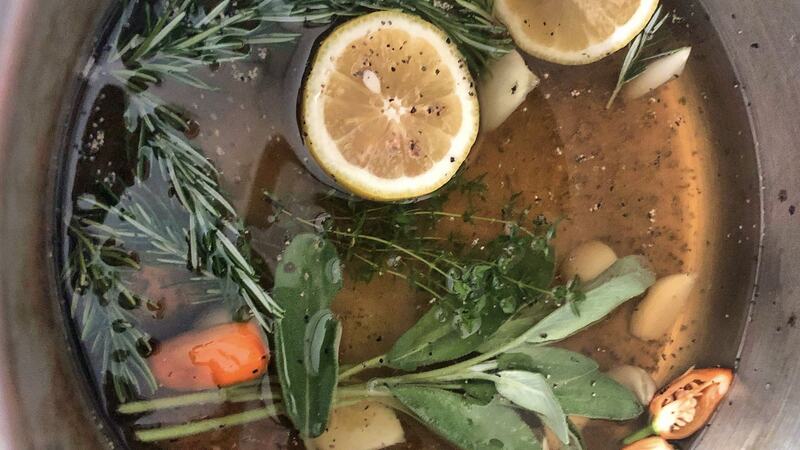 If you are doing a whole turkey or chicken, you can re-use the lemons, garlic, herbs and peppers from the brine to stuff inside for extra flavor. For the turkey breast, you can put them in the bottom of the roasting pan to add flavor to the drippings. I like to put veggies under my turkey in the roasting pan, but it’s not necessary. For the record, I used 3 chopped carrots, 3 chopped celery stalks and a chopped yellow onion. Remove turkey from the brine and pat dry. Preheat the oven to 325 degrees. Mix all the spices together in a bowl. Stir in the cooled, melted butter to create a paste. Slather the turkey all over in the spice mixture. 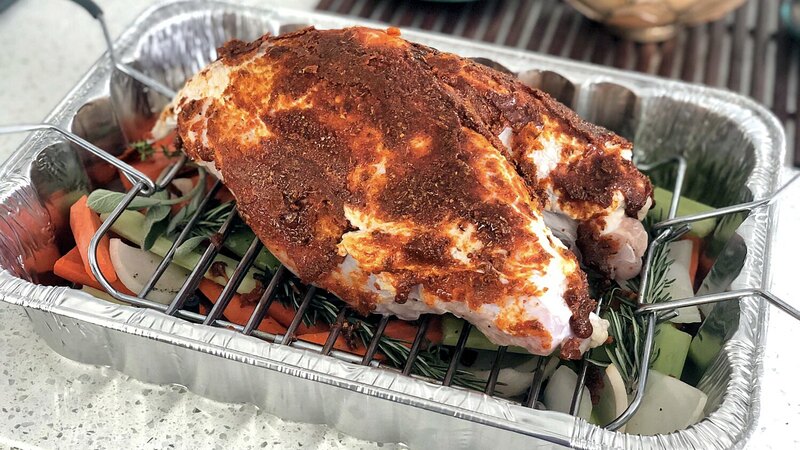 Place the turkey on a rack in a roasting pan & tent it with foil, careful to keep it from touching & rubbing off the spice mixture. Cook for 30 minutes covered, then remove & cook another 30 minutes. Start checking the temperature every 15-20 minutes from here, until it reaches an internal temp of 155-160. Remove the turkey from the roasting rack, place on a cutting board, tent with foil and let it rest 30 minutes before carving. Reserve pan drippings to add to your gravy. If you have kiddos or aren’t a spicy fan, leave the habaneros out of the brine and the cayenne out of the rub, and you will still have a tasty turkey. The rub goes on pretty thick and creates almost a crust, which really helps lock in all the flavor and juices. I’ve been working on this for a couple years and it always gets rave reviews. Turkey has a reputation for being bland and boring, so you have to add a lot to get a lot out of it, but honestly it’s not a ton of work. Just a ton of ingredients. 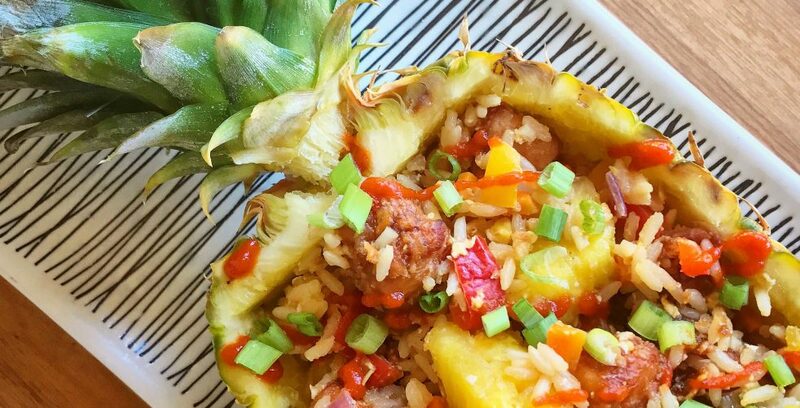 Even if it’s not the holidays, you could do this with chicken any time of year, for any occasion. It’s a perfect Sunday dinner. And if you happen to see turkey breast on sale at the store, grab it and try this out one weekend. Serve it over some mashed potatoes or roasted vegetables. Slice it thin, and have incredible sandwiches all week long. Use the carcass to make stock for your next soup. Why does turkey just have to be for Thanksgiving? Not just turkey either. In a few days, I’ll be back with my Hawaiian sweet roll stuffing! See you then!